Rayman Origins was one of the biggest surprises for me back in 2011. It was such a fun game that I almost beat it in under a week, but I wanted to give myself some time to really enjoy it and see everything that it had to offer. It had great 2D graphics, really creative level design, and some fun bosses. My only complaints were that the bosses only came in halfway through the game, and the final level is a little too timing-centric as far as when you needed to jump, run, or grab. However, that is just me, and I just played the heck out of it on my Xbox 360. Like everyone else, I was excited when they were going to make a sequel to the game and call it Rayman Legends. Of course, I was also upset like everyone else when they delayed the game and made it multi-platform instead of a Wii U exclusive. I thought it was a bad idea, and I know Ubisoft has tried to apologize multiple times for delaying the game, but some of their excuses were iffy at best. Luckily, the release of it a few months back didn’t hurt the quality of the game when I got it on my Wii U. It is easily one of my favorite games of 2013. The game still has some issues that linger in it, due to the multi-platform, but the versions with a touchpad or touchscreen are obviously the best versions to get. 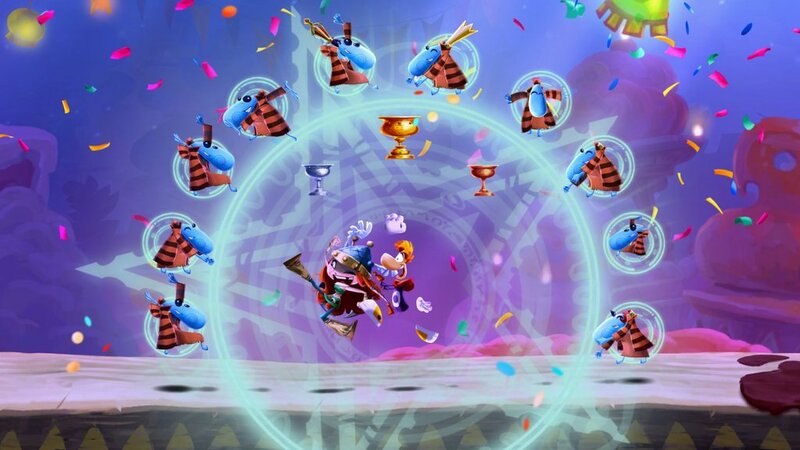 The story of Rayman Legends isn’t too important to the overall game, which is nice. I mean, I did like the mood and story from Rayman 2: The Great Escape, but sometimes, the story gets in the way. 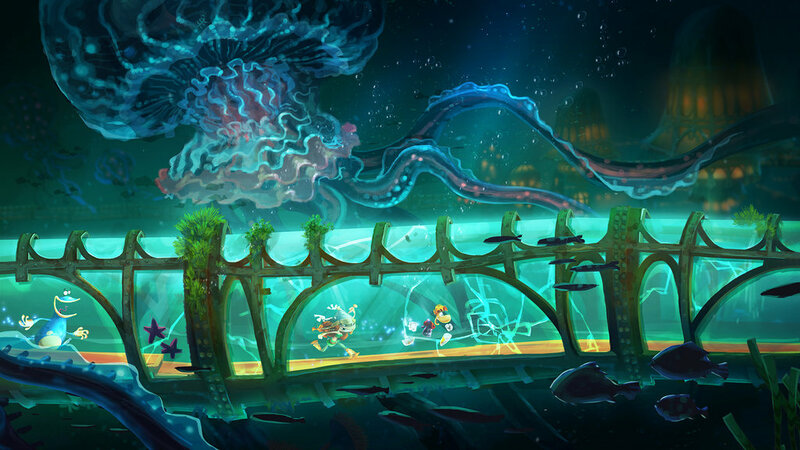 Basically, a bunch of paintings that include their own worlds are in this one location where Rayman and his friends are resting. The villain from the first game is back, and has formed a massive army to capture the other Teensies. 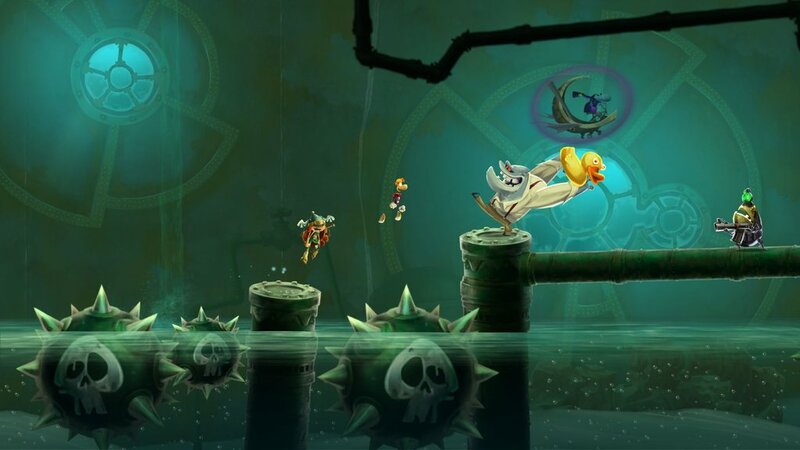 It is up to Rayman and his friends to get them back and save the land. Let us move on since the game’s story doesn’t really matter in the long run. 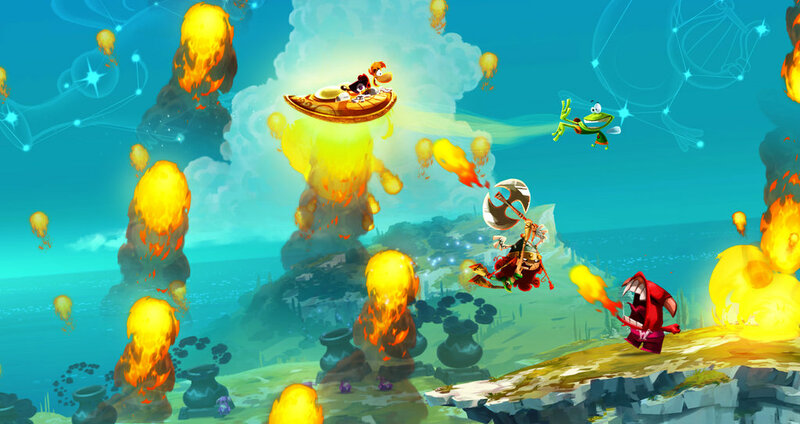 Rayman Legends doesn’t fix what isn’t broken, and stays a 2D platformer with a few new tricks up its sleeve. 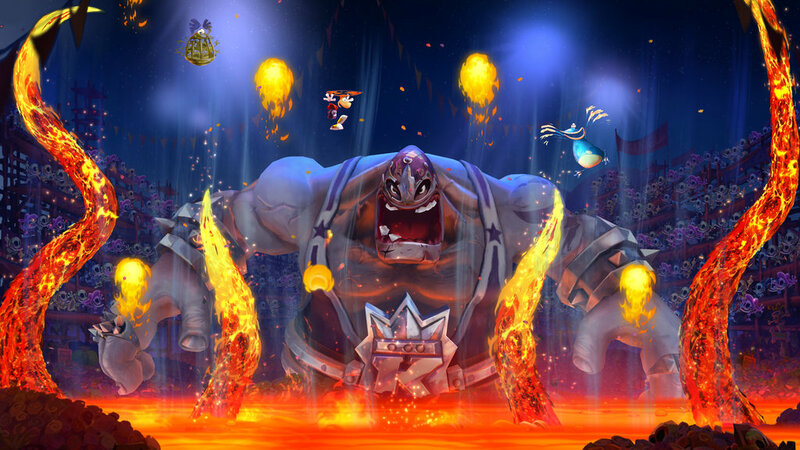 Most of the abilities you gained in the first game, like running on walls, hovering around, and turning small are still with Rayman and friends, but some new mechanics are thrown in with the character Murphy. Murphy, on the versions with touchpad/screen controls, can do a multitude of things, like tickle larger enemies, take care of certain hazards, hold up a shield for protection or platforming purposes, and in certain levels, eat through some of the levels. Murphy can still be controlled by controllers for the PlayStation 3 and Xbox 360 versions, but I will talk about that later. A new character has also been added in the form of a female Viking named Barbara. She wields an axe, but her character isn’t too different from the others. The level variety ranges from jungles, to underwater espionage headquarters, to Day-of-the-Dead-inspired levels. There are a handful of Murphy levels, and one unique level where you must platform your way through a Guitar Hero-like level using well executed jumps. Outside of the main game, there is a fun soccer mini-game and 40 remastered levels from Rayman Origins. You also have four-player co-op or multiplayer, depending on how you look at it, and the multiple characters have different unlockable costumes. Overall, you have a massive amount of content for whatever price tag you paid when you bought this game. The graphics are amazing in this game. It is easily one of the best looking games that uses a 2D art style. I am happy that they are going to use this game engine for other games like that RPG Child of Light, which I am looking forward to! It just shows that you don’t need to have all CG 3D graphics to make a game look good. The music is also beautifully done, and it fits the mood in just about every level. One of the composers for the game was Christophe Héral. He composed the soundtracks of games like Beyond Good and Evil and Rayman Origins. It is just a multitude of different kinds of music, and it gives more personality to the game. This game is almost perfect, and I really do mean that, but it has some issues. While I love the idea of the Murphy stages, I do think they might have added too many of them in each world. I think two or so would have been nice, but some worlds had three, and to me, Rayman Legends is all about the well-executed platforming. I liked the gimmicks with the Wii U GamePad, but I don’t like it when a gimmick is shoved in front of me to use for a majority of the game. I guess this is just me, since the Murphy gimmick can also be pretty fun at times. One criticism I kept seeing was that there was no online multiplayer. I am sorry, but I disagree with that criticism. With a game like Rayman Legends where you need to time your jumps perfectly, I don’t think online multiplayer should be a feature. I mean, what if you have to deal with lag on top of someone else, or you are dealing with Murphy? I also feel like it was a bit of a waste of time to put it onto consoles that didn’t have touch screens or touch pads to use the Murphy mechanic with. This results in the other versions being a little clunkier, and it shows that it was originally meant to be for a specific console. I don’t mean to hate on Ubisoft for doing that, but when a game is meant to be used on a specific console, then make it for that console. Don’t freaking delay the game at the last minute, and make it multiplatform, resulting in other versions not ending up as good. In my opinion, the excuse of making it multiplatform because ZombiU on the Wii U didn’t do so well, as well as other issues that Ubisoft has commented on, are kind of iffy. Delaying the game and putting it on other consoles because of financial reasons shouldn’t be an excuse when you have enough money to keep releasing Assassin Creed games every year. Sure, you might have made a lot more money by putting it on other consoles, but since the game’s sales have been lower than expected, then what was the point? I blame the low sales on the last minute delay and then making it multiplatform, which made Rayman Legend less unique and special since it was designed with that console in mind. Maybe I am just being harsher than I should be since I don’t know what goes on behind closed doors, but the excuses and the end result does hurt the overall experience to an extent. Sorry about that. Anyway, I freaking loved this game, and it is, like I said above, one of my favorite games of 2013. I will say that I do wish we could have gotten something like the original trailer showed us, like the Rabbid levels or the ability to use the scanner part of the Wii U GamePad. You can pick up different console versions of the game, but for my money, I would get the version for the Wii U or PlayStation Vita so you don’t have to worry about clunky Murphy controls on other consoles that don’t have a touch screen. 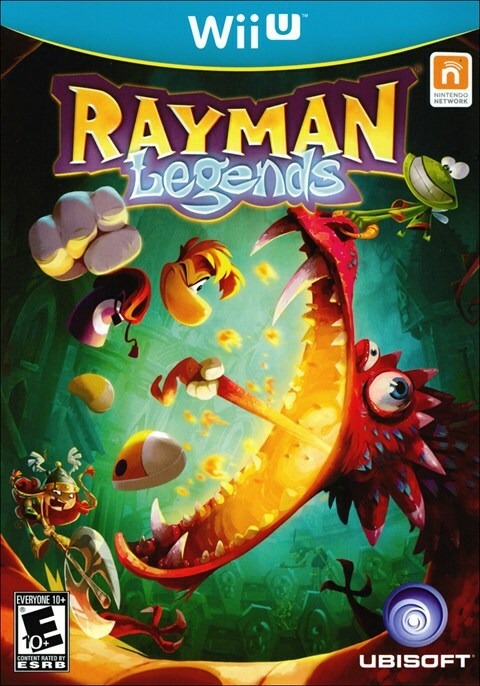 I do hope that we can get another Rayman game like this, despite Legend’s low sales. Just hope we can keep Rayman pure and not fall under the yearly sequel disease like so many other games have fallen into. This is yet another fantastic game Rayman can add to his library.